Looking for a compact sedan with the GTI’s fun factor? This Jetta ticks all the boxes. With more than 300 turns laid out over the course of 11 miles, the Tail of the Dragon is not a road for the casual driver. Situated at the border of Tennessee and North Carolina, this section of Route 129 sports a winding layout that follows a trail originally stamped out by bison that were looking for the easiest path up the mountain range. It has more than twice the corners of Germany’s Nürburgring track dispatched over a shorter distance, so it’s a highly technical piece of tarmac that will keep even the most seasoned wheelmen busy. The 2019 Jetta GLI is up to the task, though. Touted as a Jetta with the heart and soul of a Golf GTI, the GLI is outfitted with the performance accoutrements of Volkswagen’s hot hatch while offering a sedan profile and a lower price tag. 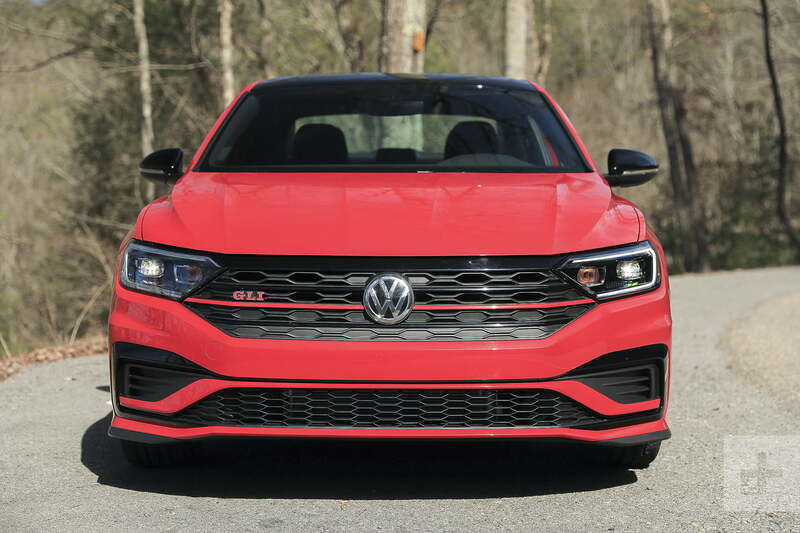 Along with sportier looks, revised suspension tuning, and brake components borrowed from the mighty Golf R, the GLI receives Volkswagen’s familiar turbocharged, 2.0-liter four cylinder engine. 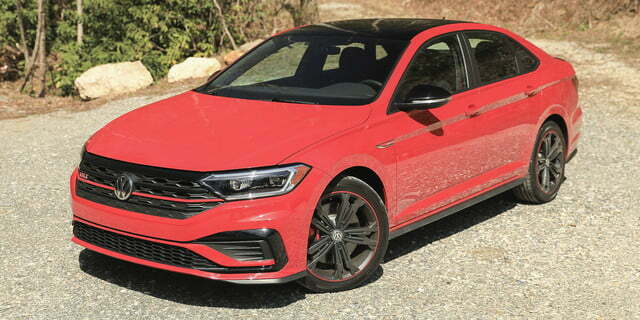 As in the GTI, the mill makes 228 horsepower and 258 pound-feet of torque, improvements of 18 and 51, respectively, over the previous-generation Jetta GLI. 2019 also marks the 35th anniversary of the GLI nameplate, and Volkswagen is building 3,500 special edition models to celebrate. 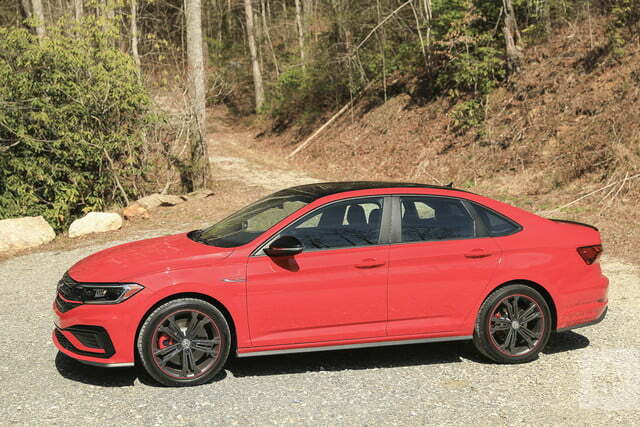 Along with the $26,995 35th Anniversary GLI, which boasts package-exclusive features like Dynamic Chassis Control (DCC) and unique 18-inch wheels, the performance-focused Jetta is also available in base GLI S spec ($25,995) as well as the top-tier Autobahn trim ($29,195), which adds luxury content like a panoramic sunroof, an 8.0-inch infotainment system, a 400-watt stereo, and Volkswagen’s Digital Cockpit. 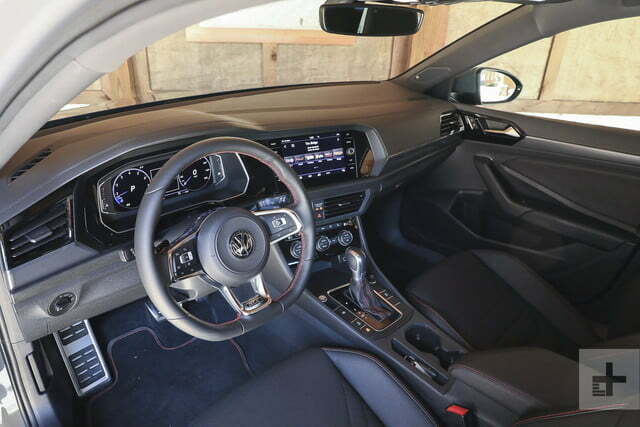 And, unlike last year, all models come standard with a six-speed manual transmission, while Volkswagen’s seven-speed, dual-clutch automatic gearbox is available for an additional $800. 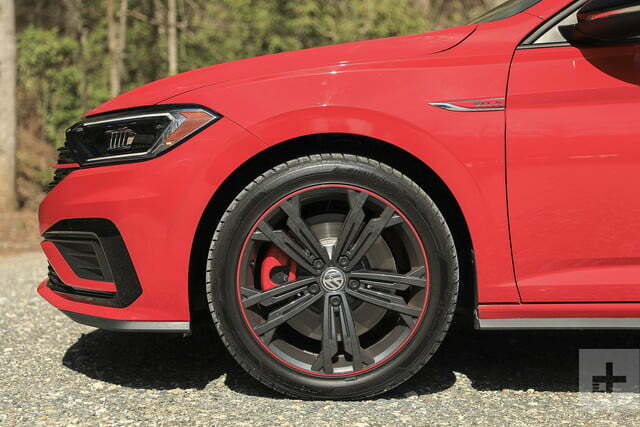 To help the GLI stand out from a garden-variety Jetta, Volkswagen outfitted the sedan with 18-inch aluminum wheels, unique front and rear fascias, red brake calipers, a black grille with honeycomb inserts, a rear spoiler, and dual exhaust outlets. While the Jetta’s look might not crane as many necks as a Lamborghini Aventador SVJ, it’s still a handsome sedan. The subtly sculpted bodywork lends itself to the performance-focused treatment of the GLI package, while the standard LED headlights and daytime running lights give the model an upscale look. 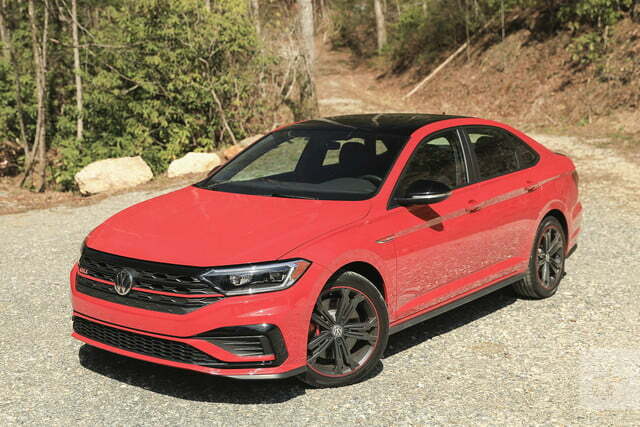 Even if the Jetta’s overall styling is still a bit anonymous, the visual tweaks do yield a more sporting aesthetic that’s further aided by fact that the GLI sits 0.6 inches lower than the regular Jetta. 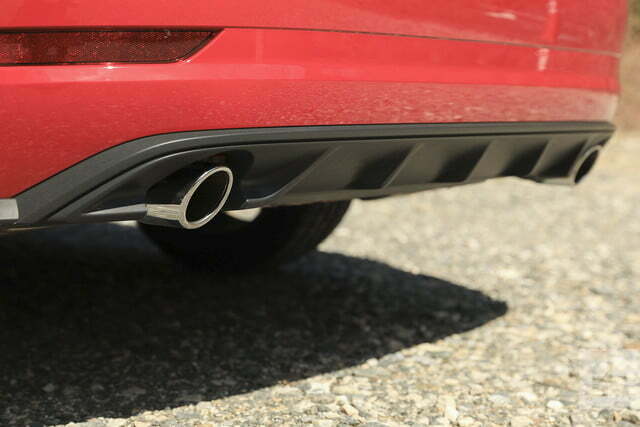 There are a few nods to the Jetta’s performance intentions found in the cabin. Red stitching on the seats, steering wheel, shifter, armrest, and floor mats add visual flair, while the flat-bottomed and leather-wrapped steering wheel also sports GLI badging. 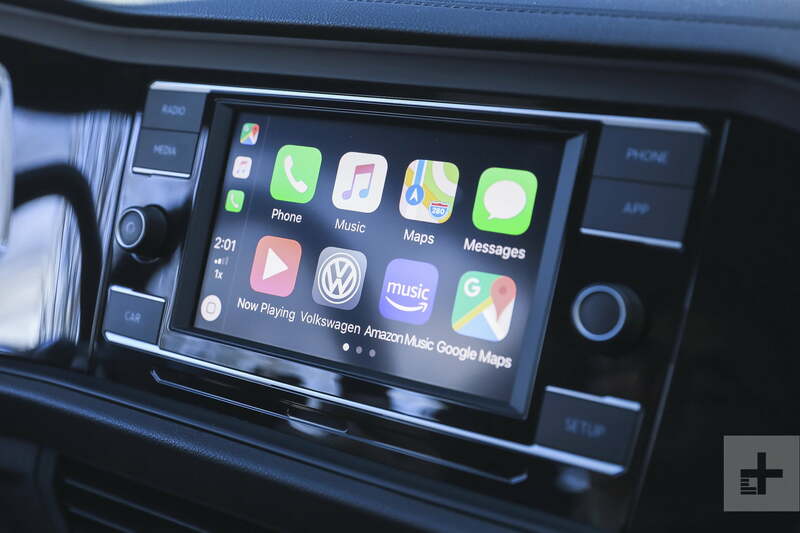 The Jetta GLI comes standard with a 6.5-inch touchscreen system, which includes a six-speaker audio system and a single USB port. The interior doesn’t stray far from regular Jetta otherwise, but that’s not necessarily a bad thing. Fit and finish are both among the best in the class, and the materials on hand make the GLI feel like a more expensive machine than it actually is. 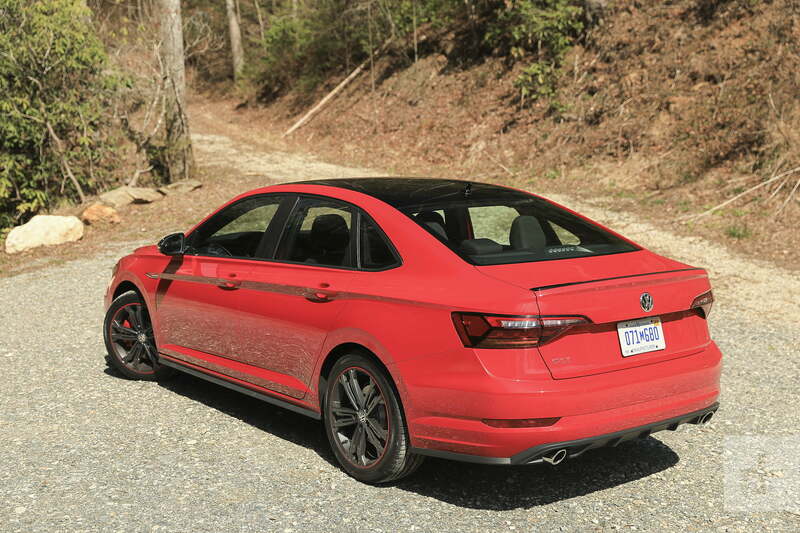 As with the standard Jetta, the GLI offers seating for five and 94.7 cubic feet of passenger volume, along with 14.1 cubic feet of cargo capacity in the trunk. 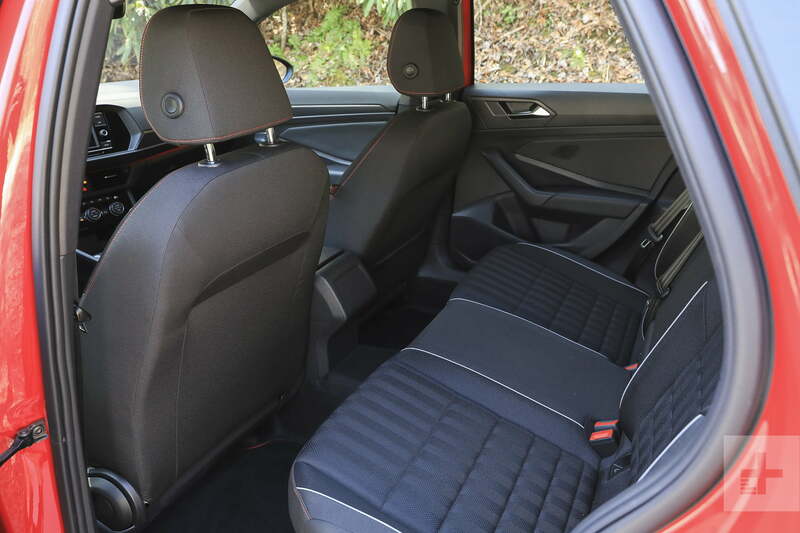 Ample leg and headroom are available up front, even for taller occupants, but adult sitting in the back will be well aware of the Jetta’s compact dimensions. Its closest rival, the Honda Civic Si offers 15.1 cubes. Volkswagen’s electronic limited-slip differential helps intelligently manage power delivery to the front wheels, and it’s aided by technology the company calls XDS. If the XDS system detects excessive unloading of the inside wheel of the front axle during fast cornering, brake pressure is applied to it to help restore stability and tuck the car into the turn. It’s essentially torque vectoring. This system helps mitigate understeer, allowing drivers to maintain greater speeds through the turn, and get on the power earlier as they exit the corner. 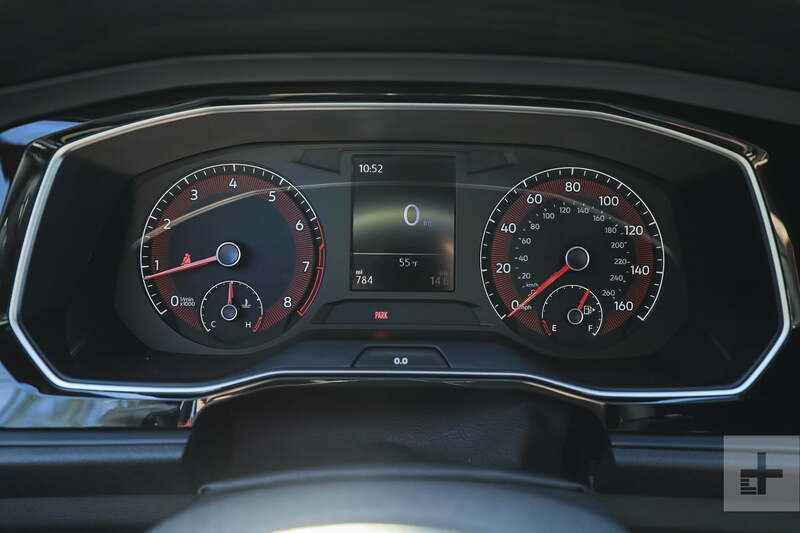 Driving mode selection comes standard across the GLI lineup, offering Normal, Sport, Eco, and Custom options. Sport mode delivers more urgent throttle and shift response, tighter steering, and a livelier engine soundtrack, while Eco dials things back a bit in the name of improved efficiency. The 35th Anniversary trim also includes DCC, which allows the driver to adjust suspension stiffness through these drive modes while adding a fifth driving mode called Comfort to the roster. On the infotainment front, the Jetta GLI comes standard with a 6.5-inch Composition Color touchscreen system, which includes a six-speaker audio system and a single USB port. While the system lacks navigation and looks a bit low-rent, it’s compatible with Apple CarPlay, Android Auto, and Mirrorlink, so the lack of on-board features won’t be sorely missed by many. 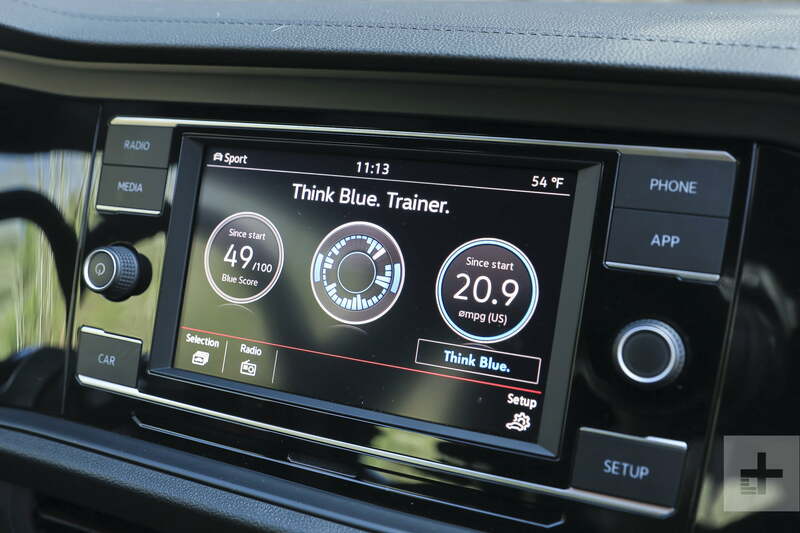 Those who spring for the Autobahn trim score a driver-configurable, 10.25-inch digital gauge cluster as well as a nicer-looking 8.0-inch touchscreen, satellite radio, and a second USB port. Digital Cockpit lets drivers choose the information they want to see. Options include a timer, the total distance driven, or real-time fuel economy. It’s a bit like the Audi’s Virtual Cockpit, and it makes the Jetta one of the most tech-savvy cars in its class. While the GLI remained an agreeable cohort during our 50-mile trek out to the woods from our starting point in Knoxville, Tennessee, with the unobtrusive road manners and admirable noise isolation that we’ve come to expect from modern Volkswagens, the GLI didn’t really start to tell its story until we made our way to Tail of the Dragon. 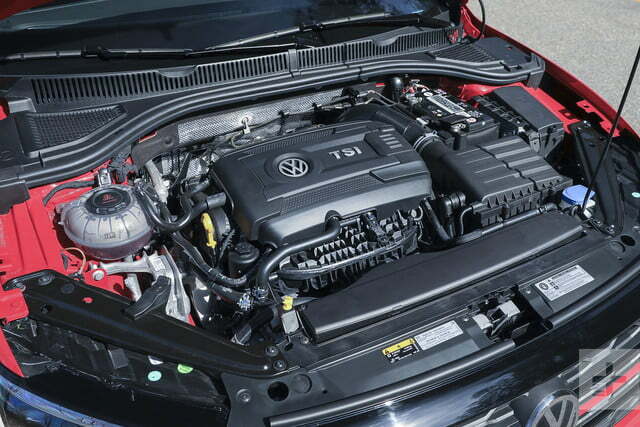 The GLI’s significant torque advantage makes acceleration feel more urgent across the board. Packing the GTI’s recently-revised 2.0-liter turbo engine, the Jetta GLI felt eager to tackle this demanding stretch of highway, though it quickly became clear that the gear ratios in the seven-speed automatic weren’t ideal for this particular road, as we often found ourselves constantly bouncing back and forth between second and third gear – third couldn’t provide enough low-end grunt out of slow corners, but second simply wasn’t long enough for many of the sections between one turn and the next. The manual transmission was better suited to the job, and more engaging on the whole. 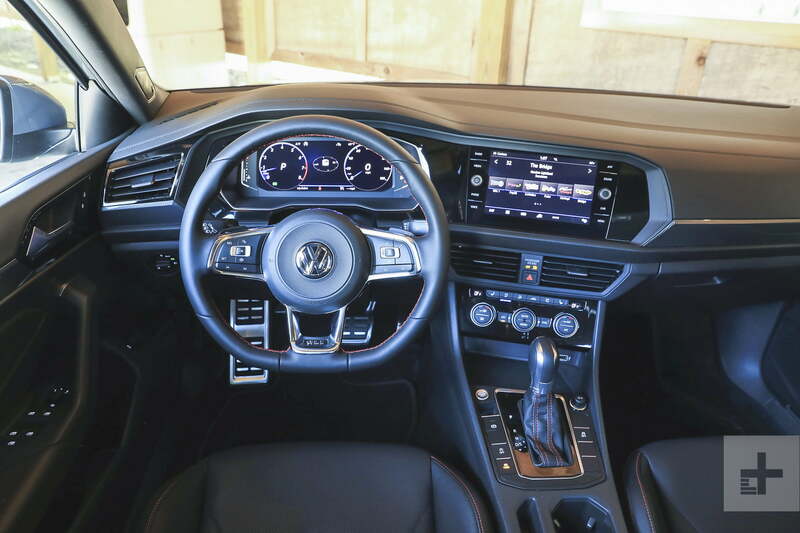 As evidenced elsewhere in Volkswagen’s performance lineup, the six-speed shifter offers satisfyingly short and precise throws while the clutch, though light on effort, communicates a clear engagement point that makes the gearbox very easy to acclimate to. During our stint with the Jetta GLI we had a chance to sample both the S and the 35th Anniversary trim levels. As mentioned previously, the GLI’s adaptive suspension setup is currently only available in the 35th Anniversary package, and that alone makes it the current trim of choice. While the GLI’s standard suspension tuning is sportier than a regular Jetta’s, it’s a noticeable step or two behind the DCC setup, which offers sharper turn-in and noticeably better body control than the S (and presumably the Autobahn) when set to Sport mode. While the GLI is more expensive than the Civic Si, its closest rival, that extra coin gets you a car that’s quicker overall. The GLI’s significant torque advantage makes acceleration feel more urgent across the board. The Civic has a great gearbox and a futuristic look, but the Si simply cannot compete with the GLI when it comes to refinement and material quality. Despite its sporting aspirations, the Jetta GLI maintains respectable fuel economy numbers of 25 mpg city, 32 highway, and 28 combined whether fitted with the seven-speed automatic or the six-speed manual transmission. Our lead-footed antics out on Tail of the Dragon skewed these numbers way outside the norm, but the numbers we saw to and from there seemed to jive with the ones provided by the Environmental Protection Agency (EPA). With affordable performance sedans currently being supplanted by hatchbacks and crossovers, the Jetta GLI is a bit of an outlier in today’s market. 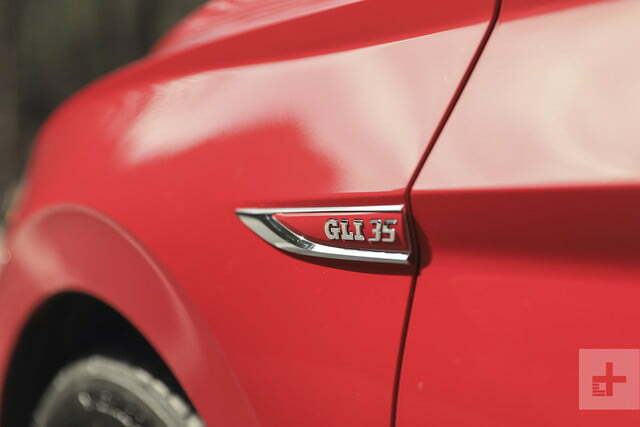 Right now, the GLI’s closest competition comes from Honda in the form of the Civic Si sedan. The Civic lacks some of the refinement and sophistication found in the Jetta, and it’s down 23 hp and 66 lb-ft. of torque compared to the GLI, but the its starting price of $23,900 before destination undercuts the GLI by more than $2,000. Whether the Honda’s more extroverted design is a feature or a bug is largely a subjective matter, but pound for pound, the GLI offers more bang for the buck for most buyers. Every GLI model comes with a six-year, 72,000-mile (whichever occurs first) bumper-to-bumper warranty, and that warranty can be transferred to a subsequent owner throughout the remainder of its duration. In terms of safety features, the Jetta GLI features six air bags, forward collision warning, autonomous emergency braking, blind spot monitoring, and rear cross-traffic alert as standard across the lineup. Frustratingly, the best options available for the Jetta GLI currently cannot be combined into one vehicle. While we like the bigger infotainment screen, the digital instrument cluster, the Beats Audio sound system, and the ventilated front seats that are all included as part of the Autobahn trim package, the DCC adaptive suspension, which is currently exclusive to the 35th Anniversary edition model, is an indispensable option for driving enthusiasts. The car is simply sharper and more composed at speed with it. Given that, we’d make do with the 6.5-inch touchscreen, analog gauges and standard seating in the 35th Anniversary model and outfit it with the six-speed manual gearbox for maximum fun. If Volkswagen decides to offer DCC on the GLI Autobahn trim once it has built the 3500 anniversary models, we’d suggest going that route to combine the improved tech with the better suspension hardware, but we’ll have to wait and see if such a pairing becomes available further down the line. With a low starting price, entertaining performance, and Volkswagen fit and finish, the GLI is a compelling package for buyers who want sports sedan response without breaking the bank to get it. While the Golf GTI offers more room for cargo, the Jetta GLI comes in at $1,600 less while offering essentially identical dynamic capability. For buyers who are looking to stray from the five-door herd while injecting a bit of sportiness into their day-to-day motoring, the Jetta GLI ticks all the boxes.